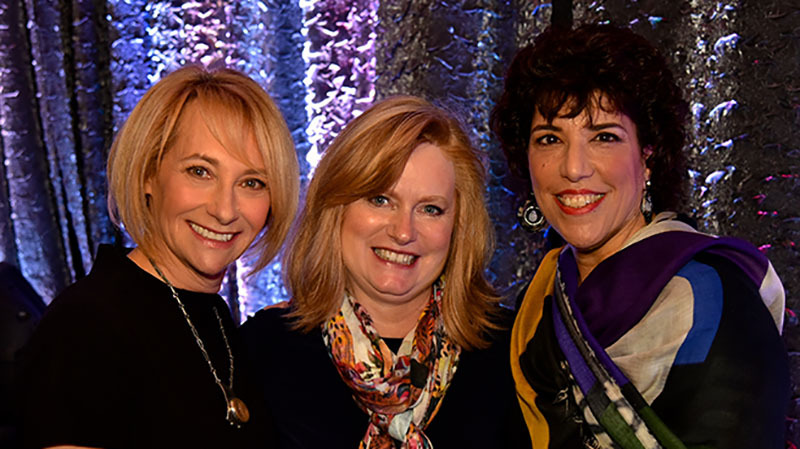 (October 26, 2015 – Toronto, Canada) – Leading producer and distributor Portfolio Entertainment is pleased to announce CEOs and Co-Founders Lisa Olfman and Joy Rosen have been named the 2015 Outstanding Achievement in Business Crystal Award recipients by the Women in Film & Television – Toronto (WIFT-T). The Crystal Awards celebrate excellence in the screen-based industry and recognize outstanding women and men who champion women working in the film, television and digital media sectors. “It is an honour and a privilege to win this year’s WIFT-T Outstanding Achievement in Business Crystal Award and join an esteemed group of industry leaders who have been recognized with the Crystal Award over the years,” said Olfman. In 24 years, Olfman and Rosen have transformed Portfolio into a production, distribution and animation powerhouse with a global reputation for creative excellence, integrity and collaboration. They continue to lead Portfolio’s growth and oversee all aspects of the business while preserving the company’s commitment to extraordinary talent, artistry and innovation. Under their leadership, the company has produced an iconic roster that includes animated series Freaktown, Emmy® award-winning series The Cat in the Hat Knows A Lot About That!, DOKI, the documentary For the Love of Dog and the television movie Stolen Miracle. They are now steering Portfolio’s expansion into new genres of production with projects in primetime, teen drama and the factual space. The duo have also built Portfolio’s distribution arm into a global player recognized for intelligent deal-making and enduring relationships with both international broadcasters and content providers. The company’s diverse catalogue ranges from food and lifestyle to kids animation, teen drama and digital content. More recently, Olfman and Rosen powered Portfolio on a multi-faceted expansion with the launch of Portfolio Animation, a state-of-the-art animation studio. In addition, the company has attracted a key senior management team, diversified its slate, amped up production output and relocated to vibrant new headquarters in downtown Toronto. Since 1988, WIFT-T has recognized more than 125 industry leaders for their extraordinary contributions and their exemplary positive impact. The award will be presented at the WIFT-T Crystal Awards Gala Luncheon on December 1, 2015 in Toronto, Canada. Portfolio Entertainment produces and distributes kids, factual and unscripted entertainment to television and digital media content providers worldwide. With two decades of industry experience, the company has a vibrant, creative culture and an entrepreneurial edge. Portfolio’s most notable projects include the celebrated The Cat in the Hat Knows A Lot About That! ; Freaktown, an entirely new property set to launch on Teletoon in 2016; the dogumentary For the Love of Dog; and the MOW Stolen Miracle. The company recently launched Portfolio Animation, a creative-driven animation studio staffed with top-tier talent and cutting-edge technology providing concept development, design, storyboarding, animatic editing and full animation services. Pivotal since start-up, Portfolio’s international distribution division represents a diverse catalogue of original and third party programs and has earned a reputation for superior content, diligence and drive. Portfolio was founded by Lisa Olfman and Joy Rosen and is based in Toronto, Canada.